Amongst bands such as Attack who failed to gain the notoriety they deserve, Scanner is another excellent yet largely unknown band that has been a favorite of mine for some time now. So, you can imagine that I was especially eager to play a new Scanner CD after a long five year wait. After the 1997 release of Ball of the Damned, I figured Scanner had disbanded. With much surprise and anticipation, I now have the new Scanner CD in my hands. So, how does this new CD measure up to the band's past work? Well, it's a good album but much different than anything the band has ever released - it is much more progressive than anything I've ever heard from the band. 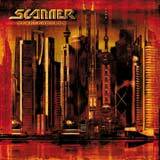 In fact, if I heard a track from this album on the radio, I'd never in a thousand years guess that it was Scanner. Scanner has seen more than its fair share of lineup changes over the years. There are only two members carried over from the previous album, Ball of the Damned, with Axel Julius being the sole original member. The band has recruited vocalist Lisa Croft to front the band much to my surprise. I am very disappointed to see Haridon Lee leave the band after delivering masterful vocals on Ball of the Damned and the 1995 masterpiece, Mental Reservation. The music itself is a bit more laid back than in the past. The thrashiness of Mental Reservation and the thick forceful guitar work of Ball of the Damned have given way to a progressive metal album with the keyboards in the forefront of the sound and the guitars much more subdued. Hallowed Be My Name is the most powerful song on the album and the only one that really makes a nod to the band's past. The keyboard textures are very thick and are the main focus of the sound. Of course, there are still some great riffs and solos (Turn of the Tide and Sister Mary are good examples) to be found, but they do take a backseat to the more complex, keyboard drenched song structures and numerous progressive breaks. The keyboard player is actually very dynamic and is able to create many different textures throughout the album, giving each song an interesting and unique feel. The band's ability to come up with excellent melodies has not changed. From the uplifting songs such as Till The Ferryman Dies, the dark and ominous sounding Engel Brecht's, and the ballad Always Alien, each of these songs carries a strong sense of melody which will resonate inside you long after the album has stopped. As for new vocalist, Lisa Croft… There are no moments where she goes out of tune and she carries the melodies quite well, but she is quite average when considering the vocalists this band has seen in the past. I'm speaking of Michael Knoblich with Ralf Scheepers' backing vocals on Hypertrace, SL Coe on Terminal Earth, and the masterful Haridon Lee on the bands past two albums. Lisa does a decent job as I said, but I don't feel that her voice is very dynamic or exciting to listen to, especially when compared to the previous talent this band has featured. The songs certainly rely on their extensive keyboard layering to make their impact on the listener. Scantropolis is a commendable "comeback" album, but also a very different album that what most Scanner fans surely expected. It would be very difficult to say whether this album is better or worse than any previous Scanner album since the musical style is so different. Taken for what this is, a progressive metal album, Scanner have done a fine job, although the vocals are quite average. If you are a big prog metal fan, I suspect that you will really enjoy this album and perhaps more so than earlier Scanner albums. Personally, I prefer the band's power and guitar driven sound of the past, especially the power / thrash masterpiece Mental Reservation.